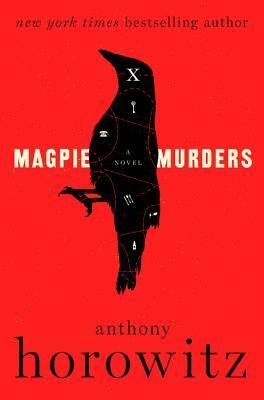 Magpie Murders is a new release from Anthony Horowitz, a murder novel within a possible-murder novel. The narrator is a book editor at a small publisher and she's just been given the next book in a detective series. She settles in for the weekend to read the manuscript and we read it along with her. Both of us notice that the last chapter is missing and we, of course, think about contacting the author -- right until the moment when we find out he is dead, a presumed suicide. The inside book is a pretty standard cozy mystery in the Poirot style. The outside book is an up-and-down journey through the actions of a woman who thinks solving a mystery in real life is just like a novel. I liked this one but didn't love it, perhaps because it was one of those books where there aren't really any likable characters. The inside author is horrible and the outside one is just a little too much of a mess to want to hang out with. So, the final word on this one is that it's fun enough to pass the time but not a do-not-miss. Bellwether by Connie Willis is one of her non-science-fiction books so don't be confused by people who label it wrongly in LibraryThing based solely on assumptions. This story takes place almost entirely in an office building, with a few forays out to trendy restaurants and cafés. 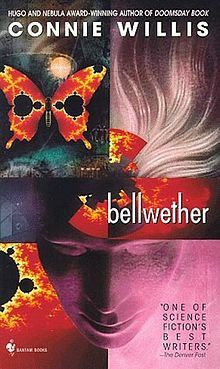 It focuses on a woman that studies fads, a man that studies chaos, a flock of sheep, and an administrative assistant named Flip. It's a bit of a comedy of errors, like To Say Nothing of the Dog, a bit of a romance, and a great satire about trends. 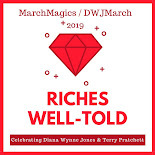 I really had fun listening to this one and it has kind of put me in the mood to binge read/reread some Willis! I read a book a few weeks ago that I felt the same way about, I just couldn't quite get into it because I didn't like any of the characters. It was such a shame too because I thought it was well written.